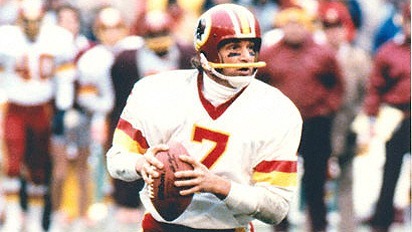 Memories of Joe Theismann, with his thick eye black and bright single-bar facemask, are often synonymous with the Washington Redskins. But what if he hadn’t worn number 7 for the red and gold? That almost was the case as Theismann, a collegiate star for Notre Dame, was actually drafted by the Miami Dolphins in 1971. Theismann, however, declined Miami’s offer of $55,000 over three years. That’s right, $55,000 over three years. Theismann asked for that amount, but the stickler was a $35,000 bonus Theismann would owe back if he missed any of the three seasons. Joe opted for the Canadian Football League’s Toronto Argonauts. In 1974, the Redskins traded for Theismann’s rights and he jumped straight into the lineup – as a punt returner. He didn’t start at quarterback until 1976. At the time Theisman was drafted, Bob Griese had been the Dolphins’ starter since 1967. He led them to the playoffs in 1970 before three consecutive Super Bowls in the following years. It’s possible that Theismann might have toiled in obscurity until 1980, when Griese suffered a career ending shoulder injury. It’s also possible Griese would have lost his job to Theismann in 1972, after Griese went down in Week 5 with a dislocated ankle and broken leg. Also, a potential quarterback controversy might have threatened the Dolphins back-to-back championships with a divided locker room. For the two quarterbacks, things turned out as well as they could have. Griese went on to the Hall of Fame, and Theismann went on to win Super Bowl 17 with Washington. Ironically, the Super Bowl win came against the Dolphins, after Griese’s career had ended. Theismann didn’t produce the game’s most memorable moments, however, throwing two interceptions in the second half while Miami clung to a slim lead. John Riggins proved to be the game’s hero, with a 43-yard rumble on 4th and 1 that proved to be the winning touchdown. Theismann also quarterbacked Washington to Super Bowl 18, a 38-9 thumping at the hands of the Los Angeles Raiders. It wasn’t the first time Raiders quarterback Jim Plunkett took the spotlight from Theismann: Theismann finished second to Plunkett in the voting for the 1970 Heisman Trophy.